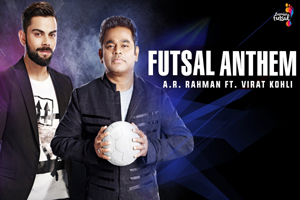 A pop song sung by Karthik, Lady Kash, Virat Kohli, A R Rahman, with lyrics penned by DDB Mudra Group. The video of this song is available on YouTube at the official channel unisysmusic. This video is of 1 minutes 12 seconds duration. Lyrics in Hindi (Unicode) of "फुटसाल एंथम"